In our culture, we are obsessed with time. Because of this, it is inevitable that some of the basics begin to become neglected. Unfortunately, one of the most basic basics of living that often gets left behind is eating properly. I know affluent, professional people whose evening meal is a constant decision about which take-out place to frequent on which particular evening. And no matter how good the take-out, there’s a part of me that really thinks that all that food made with only sustenance in mind (no thought for either love or health) just can’t be good for you. 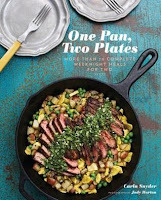 The book is focused on making beautiful one dish meals for two people -- a couple, perhaps or a parent and child -- but some of these would be terrific for a single, as well: dinner tonight and lunch for one reheated at work tomorrow. Either way, life gets a whole lot healthier. Healthier and more delicious. Here’s a sampling of what’s on offer: Veal Piccata with Brussels Sprouts Hash and Apples. Rib-Eye Steaks Florentine. Crispy Sage Pork Cutlets with Couscous. Tuna Burgers. Fried Green Tomato Sandwiches. Barley and Lentil Salad. Pasta Carbonara. Wild Mushroom Frittata. Clearly I could go on -- there are “over 70 complete weeknight meals for two” included in the book -- but you get the idea. Thank you this sounds like a terrific book, when children leave the nest or perhaps a single parent. My mom is always saying it is hard to cook for one.